You are at:Home»Basketball»Dive for that loose ball! When the Navy agreed to hold an NCAA basketball game on the flight deck of the carrier Carl Vinson, one probably could have gotten decent odds against the prospect of rain in San Diego on Veterans Day. Now there’s an 80 percent chance, and it’s looking like the highly anticipated North Carolina-Michigan State game could get bumped downstairs to the much smaller hangar deck. That’s bad news for some ticket holders — just about all of them military personnel — because only 4,000 or 5,000 of the 7,000 who could attend topside would be able to squeeze into the hangar deck. On top of that, an entire basketball court and stands had been erected topside. Workers are now feverishly assembling a second court on the hangar deck, my colleague Gidget Fuentes tells me. But really, now: Who needs a wooden basketball court? The players are playing for veterans. Wouldn’t it be more interesting to let them play on the non-skid-covered deck, like sailors at sea do? 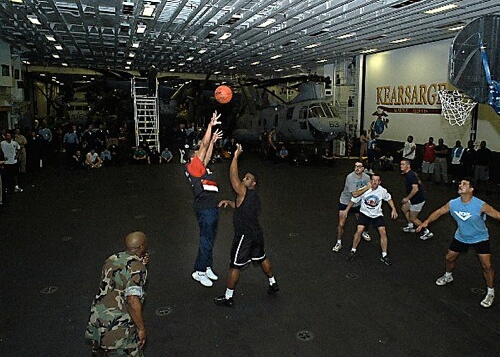 Sailors and Marines participate in a "3 on 3" basketball tournament in the hangar bay aboard the amphibious assault ship USS Kearsarge (LHD 3), on March 2, 2003, during fund raising efforts to support the Navy and Marine Corps Relief Society. Kearsarge was in the Persian Gulf, operating in support of Operation Enduring Freedom. // U.S. Navy photo by Photographer’s Mate 2nd Class Alicia Tasz.